Our winter weather has finally hit. After a very warm and rainy December, the snow and ice are here. I guess I should have known that the warm weather was too good to be true. And to be truthful, I really want a good snow and cold weather. It will help with the garden come spring. Snow will put nitrogen into the ground and the cold weather will help kill some of the bugs. Even with the winter weather, I have been bitten by the canning bug. I really didn't get to can much this past summer because of how horrible our garden did due to the massive amounts of rain we had. Our fall garden did very well, but not enough to can, just enough for us to eat as I picked it. Some years back, my dad made the best apple jelly. I asked him how he did it and he told me he used apple juice that he bought at the store. I was shocked, I didn't even know at the time you could do that! 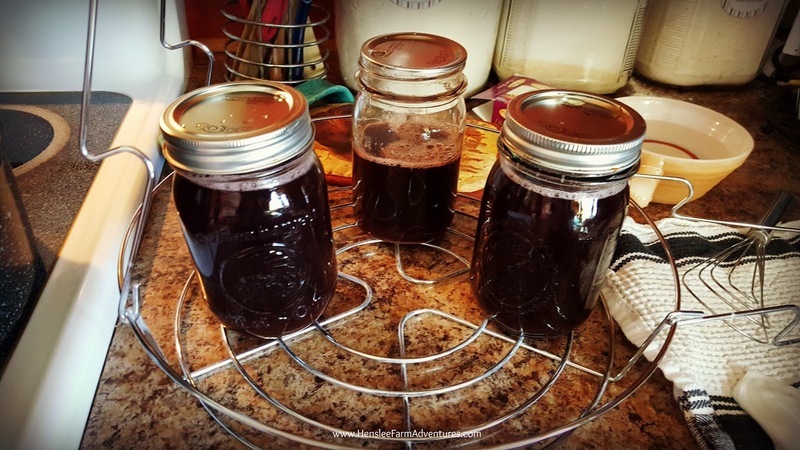 I was used to my parents making jellies, jams, and fruit butters from actual fruit that they either grew or bought from a farm. Fast forward a few years and I have finally made jelly from juice. I decided to make grape jelly because my family loves grape jelly and the kids eat a lot of peanut butter and jelly sandwiches. I want to make sure that they jelly that they eat is as wholesome as a jelly can be. So making it myself would not only ensure that, but would also save money in the long run. I had all natural grape juice on hand and found the pectin I wanted to use which requires little to no sugar added. I just can't fathom adding 7-8 cups of sugar to something that is already sweet! So here it is, some of the easiest jelly I have ever made. Pictured are the ingredients. That's it. That is all it took. You can add in a cup of sugar if you like. I didn't for my first batch. Please note that I used Lite Fruit Pectin. If you do not want to add sugar or very little sugar, or even a sugar substitute you must use a pectin that says it is for low to no sugar. 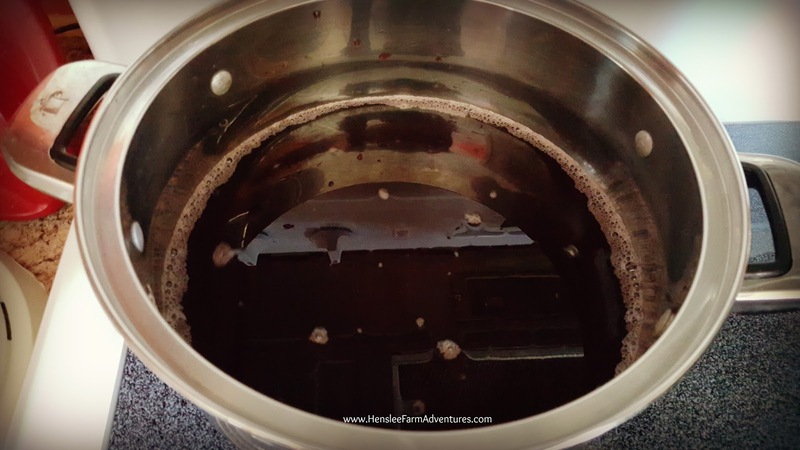 Put 4-5 cups of juice into a pot and bring to a gentle boil. I used 5 cups. 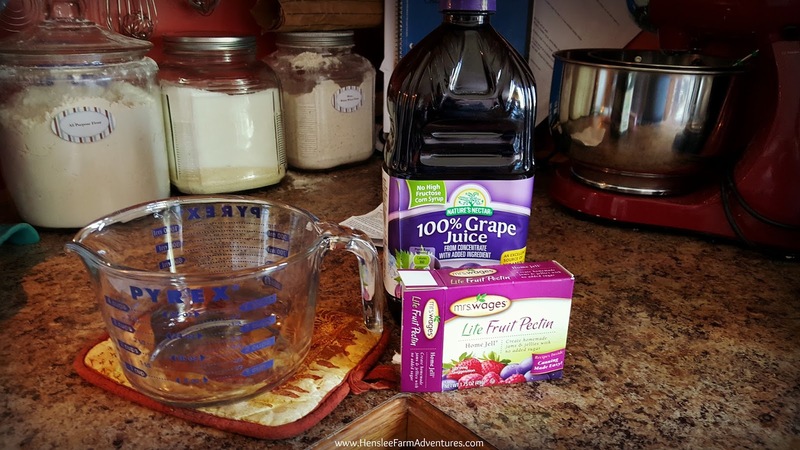 Grape juice ready to cook. Once boiling add in pectin. Cook for 1 minute while stirring. DO NOT OVERCOOK! If you do, it breaks down the pectin and it will not jell. Once you have cooked for 1 minute, skim off the foam that has formed on top. This is the foam that I was able to take off the top. Then ladle the juice into clean sterilized jars. I used pints because we do use quite a bit of this at one time. You could also use jelly jars. I was able to get 2 1/2 pints from one batch. Ready to go into the water bath canner. 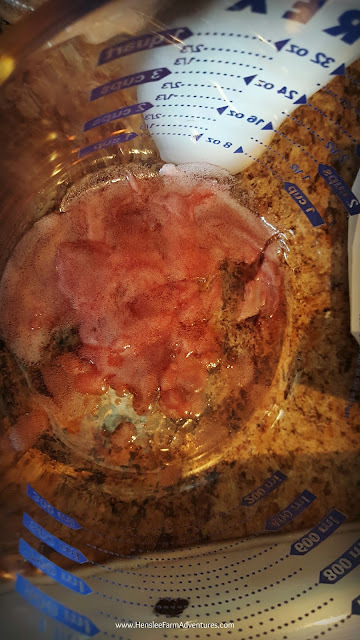 Put it in a water bath canner and process for 10 minutes. Once processed, let sit for at least 24 hours to make sure that they have sealed. If any have not sealed, put in the fridge immediately and use. We put the 1/2 pint jar in the fridge and are using that. Like I said earlier the first batch I made was with no added sugar. The next batch I will make I will add sugar. I decided that no sugar was going a little too far. One cup of sugar should be enough to help give it some added flavor. The jelly jelled very nicely. I will absolutely use this method again. In fact the pectin that I used has detailed instructions on how to make jelly using juice you have bought. 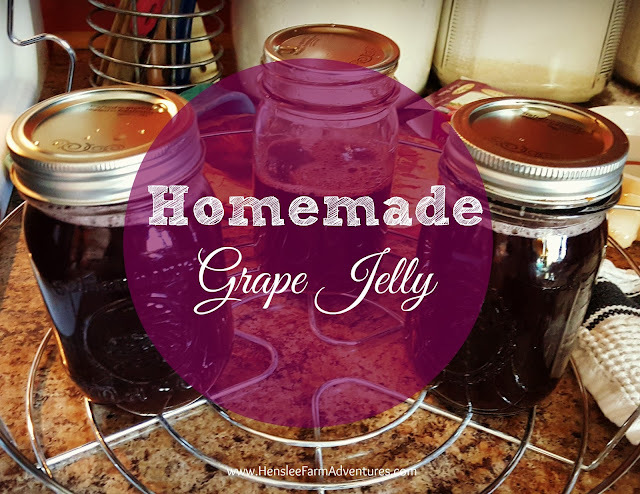 After grape, I will be making some apple jelly using store bought apple juice since that is one of my favorites! Since I had the canner out and I had several jars cleaned and sterilized, I decided to can some other items. 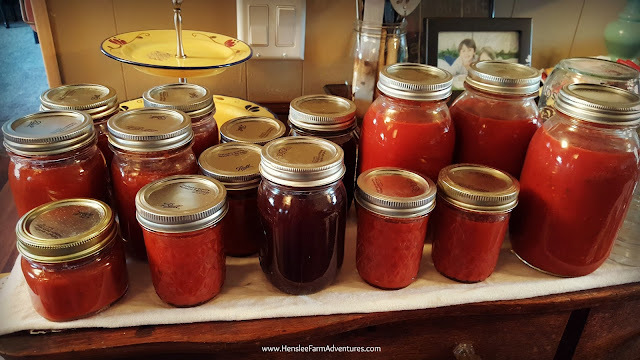 I ended up canning spaghetti sauce and pizza sauce. I love using Mrs. Wages brand seasonings because it is so easy (just add canned tomatoes if fresh are not available) and the seasonings are really good! (I am not getting paid to say that.) I really would suggest trying them. The only thing that I have not tried of Mrs. Wages is their pickle seasonings. I like my own version of dill, sweet and spicy, and bread and butter, so I don't see a need to buy the premade seasonings. Pizza sauce, grape jelly, and spaghetti sauce. Remember that canning does not have to be just a summer thing. You can can food at anytime of the year. I realize it might not be with food out of your garden, but it is still better than store bought canned versions. Do you can in the winter?